Redmi 7 debuted on Monday in China and today it already began its global rollout. The official Facebook page of the Ukrainian division announced the phone is available for online pre-order at partner retailers and offline purchase at the official Mi Store. Currently the price of the 2/16 GB variant starts from UAH3,999 or $147/€130. Redmi 7 comes with a 6.26” HD+ screen and Snapdragon 632 chipset. The dual camera on the back is 12 MP + 2 MP, while the battery is 4,000 mAh, but charges at standard 10W rates. It was announced with three memory combinations, however only two are currently available in Ukraine - 2/16 GB and 4/64 GB, the latter costing UAH4,999 ($185/€162). Xiaomi Ukraine has over 60 stores across the European country, most of them part of the Allo network. 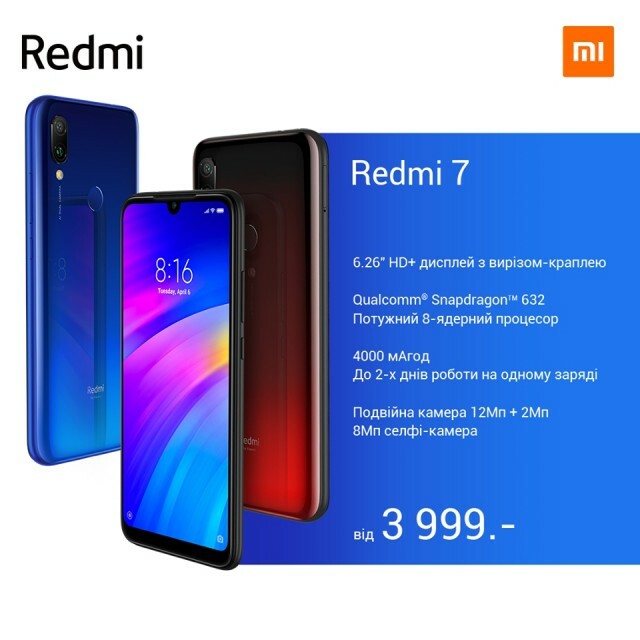 Although the Redmi 7 is already available for purchase, the Redmi Note 7 is two months older and is yet to hit the market - an event is scheduled for March 25 in the capital Kyiv.